The history of horror in video games is an interesting tale, some say starting with a few games on the Atari 2600, some saying even farther, to Haunted House on the Magnavox Odyssey. But it would be the 32-bit era when survival horror would really take off, appearing almost out of nowhere to become a major factor in console wars, especially with the PlayStation. 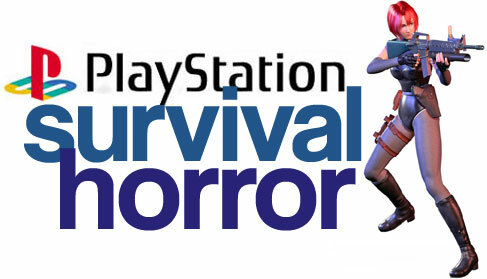 Yet survival horror is a strange genre, because it is based around themes instead of gameplay mechanics. 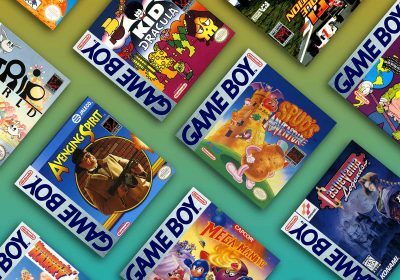 What other genre can incorporate point-and-click adventures, third-person action games, RPGs, and first-person shooters without skipping a beat? So, to help gain an understanding of the genre, and possibly lead a few collectors to track down titles they’ve never played before, here is the list of survival horror titles for the original PlayStation. It should be noted, if multiple titles in a series were released on the PlayStation, they ended up in the series category instead of the singles, even if the sequels were not really survival horror titles. 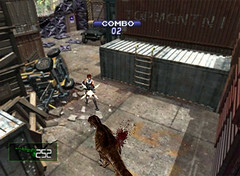 Hence titles like Dino Crisis are listed as series, though only the first is considered true survival horror. All release dates were provided by GameFAQs. Also, while I tried to provide the more influential titles first, the listings aren’t in any particular order, except for the Honorable Mentions section, which is in alphabetical order. 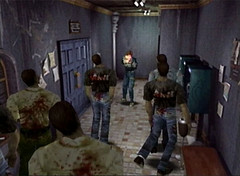 Resident Evil is easily one of the biggest names in the genre, and is credited with creating the term “survival horror.” The series also standardized the control scheme and many other elements that would dominate survival horror games for this generation, to the point that other survival horrors became known as RE clones. The plots tend to follow a particular group of characters, usually police officers or in related fields, as they battle a pharmaceuticals corporation named Umbrella. But Umbrella also does work with biological weapons, which have a nasty habit of getting loose and unleashing hordes of zombies or worse. If you’ve never played a survival horror and are wondering what the genre is about, Resident Evil is probably the best place to start. Of course, due to its popularity there are a large number of spin-off titles, such as the Survivor series which first appeared on the PlayStation. While this title does feature many of the elements of the Resident Evil series, it is actually a light gun shooter, so don’t expect the same kind of gameplay you get from the others. Originally starting out on the Super Famicom, the Clock Tower series would see three releases on the PlayStation, including a port of the first game. 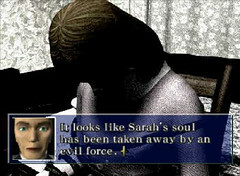 Though eventually seeing major changes in their control scheme in Clock Tower 3 on the PlayStation 2, the series would begin its life as third-person point-and-click games. In these titles, there is little in the way of combat. Instead, you are being stalked by a murderer, usually armed with a pair of gardening shears. To survive and unravel the story, you must run and hide, using your surroundings to disguise yourself and praying your stalker doesn’t find you. Beyond that, you’re helpless, and likely forced to watch as the murderer takes down everyone around you. It should be noted that the films of Dario Argento, particularly Phenomena(Creepers to those of us in the USA) are considered a major influence, so if you’re familiar with his work, you should have an understanding of what these games are like. The games are also notable for having multiple endings based on many different conditions. When I first learned of this series, is what billed to me as Resident Evil with dinosaurs. 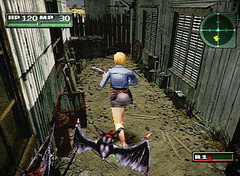 Considering it keeps many of the conventions of Resident Evil, such as controls, was created by Capcom, and features some similar story elements(once again, you’re part of a special operations team whose members are slowly picked off one by one while exploring a dangerous facility, this time on an island), but it mixes up the formula in a few ways to make it interesting. Of all these changes, perhaps most important is that the enemy has been upgraded from a slow, mindless corpse that can take a little punishment into a fast, agile, intelligent predator which can often be found in packs. And that’s only the first thing you encounter. If you’ve played through all the Resident Evils and want something similar but still dangerous, Dino Crisis is the way to go. Unfortunately once you’ve beaten the first, the second isn’t a survival horror game. I’ve included it in case people are interested, but it’s much more of a straight action game where you kill dinosaurs for points. The Parasite Eve series has the distinction of being the only series on this list based off a book, Parasite Eve, released in Japan in 1995. There’s also a film adaptation, released in 1997. 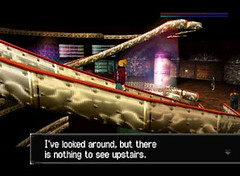 The first Parasite Eve game follows a woman named Aya, a rookie NYPD officer, who must battle it out with a creature named Eve who is attempting to create the ultimate being. In the sequel, Aya has become an FBI agent who is continuing to fight weird mitochondrial mutants, this time in the Mojave Desert. Probably most notable is that the games were created by Squaresoft, and the first is a hybrid of survival horror and RPG gameplay. The second one drops many of the RPG conventions of the first, giving a very different feel. There’s also some debate about whether Parasite Eve 2 should even be considered a survival horror game. The best course of action to decide, of course, is to play it and find out for yourself. Before Resident Evil came along and even named the genre, the first Alone in the Dark would help mod survival horror with many of its action staples. It’s a shame that the rest of the series could never quite live up to it, and the PlayStation titles are two examples. One-Eyed Jack’s Revenge is the second game in the original trilogy, in which players control series protagonist Edward Carnby as he investigates the kidnapping of a young girl by gangsters, who are actually the manifestations of ghost pirates. While it kept some of the horror elements of the first, it’s difficult to describe One-Eyed Jack’s Revenge as a true survival horror. The New Nightmare, the fourth Alone in the Dark and an attempt to reboot and update the series by bringing it from the 1930s to present day, falls closer to its genre roots. 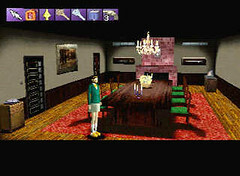 Unfortunately it is subsequently written out of the series by the fifth game, aptly named Alone in the Dark, which follows the continuity of the original trilogy. It also suffers from a few ridiculous points, such as the weapons(double-barreled revolvers anyone? ), as well as an unfortunate connection to the Uwe Boll movie adaptation. The Echo Night series has always been an interesting one. 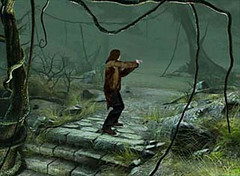 All three in the series(the third appearing on the PlayStation 2) are first-person adventures, with little control beyond a typical point-and-click game. While the Echo Nights take place in different locales and have no connecting story, they do have a connecting theme: the pacification of spirits. In the Echo Night games, you must enter an environment where spirits roam the halls, doing whatever you can to get them to accept their fates and move on. To add tension, there are angry spirits who will reach out and try to kill you if they come near you. Combine these with an oppressive atmosphere, and these games can become an interesting experience. Just don’t expect it to be pretty: the fist game was panned for its graphics and gameplay style so much, the second never saw release outside of Japan. These games are a more futuristic look at the survival horror genre, dealing with cryogenics, clones, and engineered viruses. In the first, you play as Raz Karcy, a man who awakens from cryogenic sleep with no idea who he is. He soon becomes infected with a bizarre virus that begins turning his skin green and scaly. The sequel takes place even farther in the future, around the year 2115. It centers on a young man named Arcano Brani, who wants to become a Junk Blade racer. 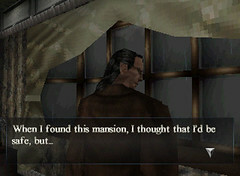 The series should be noted for being two of the first in the genre to use fully 3D environments. Unfortunately, they’re generally not considered very good. Considered by many at the time of its release to be the scariest game of all time, the first Silent Hill took the survival horror to new psychological heights. 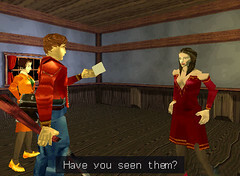 Gamers take the role of Harry Mason, a widower taking his adopted daughter Cheryl on a late-season vacation to Silent Hill. On the way, Harry wrecks his jeep and is knocked unconscious. When he comes to, snow is falling and Cheryl has disappeared. From there, Harry must wander the streets of Silent Hill, searching for his daughter. Combining a bizarre storyline, strange references to other series(such as the Wizard of Oz), a dark soundtrack, and disturbing atmosphere, Silent Hill twisted reality to a breaking point. Players were forced to rely on a radio that would emit static the closer an enemy became. Much of the game is spent fumbling around in the dark, and the flashlight only manages to attract enemies. While many games attempt for this feel, Silent Hill truly succeeds at making us afraid of what might lie around the next corner or through the next door. WARP was always an odd company, and its games were always very unique. Using full-motion videos, this game follows Laura, who must go into a hospital where her crazed father has begun murdering people. Once inside, she is suddenly teleported into a bizarre castle where she must navigate various puzzles to make it through. The game is done as a first-person graphic adventure, somewhat like a point-and-click, but without all the pointing and clicking. The castle is loaded with traps, and the players are up against a time limit. Along the way, she can collect scarabs to help tell the story, and her actions in the end will affect the ending you get. The biggest downside to D is that there isn’t much replayability, and the 3D graphics haven’t aged well, so don’t expect to be blown away. But it’s worth acquainting yourself with the game if you like survival horror, especially since it would lead to two spin-offs also staring Laura: Enemy Zero on the Sega Saturn, and D2 on the Sega Dreamcast. While running from an apocalyptic cult in Tokyo, you hide in the subway system, only to be attacked by a weird mutant creature recently escaped from a nearby research facility. After derailing your train, the creature begins murdering survivors as you and a girl named Naomi run for your lives. You escape into a nearby tunnel and find yourself in The Mesh, a series of tunnels where a group of self-sufficient citizens live. Now you must find a way to escape to the surface, along with the other citizens of The Mesh. And I do mean you. 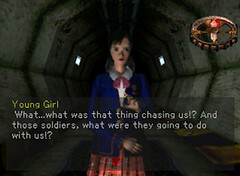 The game uses a first-person perspective to view the action, and you are allowed one companion, starting with Naomi, to come along with you on the trip. You must venture through the various tunnels of The Mesh, completing puzzles and moving on to new areas. As you move on, the creature stalks you. If the creature finds you, you must run, as there is no combat in Dark Messiah. And if the creature captures your companion, they are dead and you must find a new one to help you. Koudelka is a combination survival horror/tactical RPG. Yes, it sounds like it might be an odd combination, but it actually works out quite well. The game follows three adventurers, Koudelka Iasant, Edward Plunkett, and Father James O’Flaherty, as they investigate the bizarre events surrounding a monastery in Whales in 1898. This RPG requires the management of items and ammunition to survive and discover what is going on. 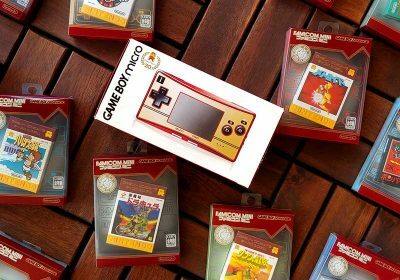 It is the brain child of Hiroki Kikuta, best known as the composer for Squaresoft’s Seiken Densetsu 2 and 3. Kikuta, tired of the direction RPGs were going in, left the company and formed his own, Sacnoth. 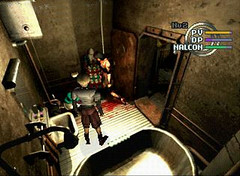 Originally he wanted Koudelka to feature a combat style similar to Resident Evil, but internal strife with coworkers led to the hybrid that is Koudelka, and he eventually resigned. Sacnoth went on to become Nautilus and created the Shadow Hearts series, which relate directly to Koudelka. So if you’re a fan of Shadow Hearts, this is one RPG to look for. Zombies not your style? Psychic violence and causing heads to explode a la Scanners more your thing? Then Galerians is probably more your thing. In it, a boy named Rion awakens in a hospital with no idea who he is. In his mind he can hear a girl screaming for help, so using a combination of psychic powers he fights his way out of the hospital in search of the girl. In the process he learns about the “G Project,” and everything swiftly goes to Hell in a handbasket. 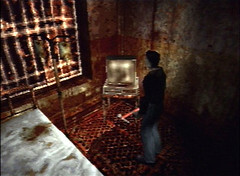 While Galerians would borrow the Resident Evil style of controls, combat is based around drug-induced mental powers. To use your powers, you must take drugs. Run out of drugs, which are limited, and you run out of power. You must also watch your health and AP. Gain too much AP, and you go nuts, killing anything that gets too close in a process known as Shorting. Do it too long, and you kill yourself. This game is presented as a series of three tales, which must be completed in order. In each, the player must make choices which will affect the ending they get. The stories are all different, focusing a detective chasing a murderer, a novelist working on a book who receives a mysterious CD, and a newlywed couple that take a bad road. Because the choices can drastically alter what happens to characters, there are multiple paths through the various tales. 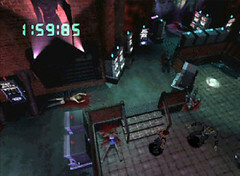 There are also quick time events where the player must press commands rapidly, or else the characters will likely get killed. Combat, when it does occur, is done via these choices or quick time events. Also, on an odd note, there’s a strange host to introduce each tale, but during gameplay nobody ever actually appears on screen. Definitely one of the weirder horror games for the console. Another first-person adventure title for the PlayStation, this game focuses on you entering the mind of your demon-possessed girlfriend in a battle for her soul. There is no combat, relying instead on puzzles. But don’t expect it to be easy. First you must explore the main hub of her soul, which looks like a large mansion, and then you must wander through the four microcosms and fend off the evil that attacks her. To explore these areas, your soul must possess the two bodies inside her soul, both of which can access various areas that other can’t. For instance, the child body can go through a small door that the adult can’t go through. 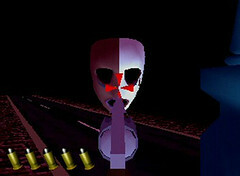 The game also relies on disturbing imagery and items to drive its point home. If you enjoy titles like D or Myst, this might be a game worth checking out. A mysterious message is received on Earth from a base on Mars saying “Stay alone, stay alive.” After ten months of radio silence from the Martian base, a small team of astronauts with different skills are sent up to find out what happened. Once there, they discover everyone dead. Now they must find out why. Gameplay in Martian Gothic requires switching between three characters on the fly, using a series of vacuum tubes to send items, or sticking items in hatches for storage. If ever any two of the three meet, the “Unification” part of the title occurs, where all three are apparently sucked together and turned into a roaming monster, at which point it’s game over. And while the game is similar to Resident Evil in terms of control and appearance, it tweaks the formula to lean more towards puzzles and away from the action, which is also held up by ever-regenerating enemies. It also requires the ability to view problems from different angles, as most puzzles will require all three characters to solve. Don’t expect this to be an easy experience. A freelance journalist is hired to go after a woman by her mother after she mysteriously disappears. So, along with his female companion, he goes off to an old house the woman was apparently investigating. Another first-person horror title, The Note features a combat system that comes off like a sluggish first person shooter, with poor controls and only one shotgun that couldn’t hit a rat at ten feet. It hardly seems enough to handle the regenerating monsters that appear in each locale, but thankfully there aren’t many. The real meat of the game is in its puzzles, which require the skillful manipulation of light sources. Windows, candles, lamps, fireplaces, all can be lit or extinguished at any time. It’s an interesting system that’s quite unique, especially for its time. Your “health meter” is also fairly unique: it’s your vision. 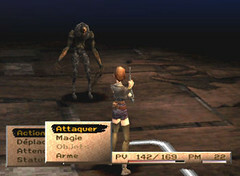 The player literally sees through the eyes of the character, who will blink every now and again. And as the player accumulates damage, their eyes slowly close. So the more damaged you are, the less you can see. It’s definitely an unusual experience. Several cells of living tissue are pulled from a meteorite that has crashed on planet Earth. A corporation named Fluxus Bioengineering Laboratories takes the cells to a secret research facility on an island off the coast of Chile, where they suddenly begin propagating. You must now find out what’s going on, by playing as either a former Navy SEAL, or a young Japanese biochemist. While the gameplay is reminiscent of Resident Evil, there’s an edge in terms of speed. There are puzzles that must be solved, hordes of enemies to fight off(sometimes with your bare hands), and long fetch quests to go on. In fact, let’s just say what it is: a Resident Evil/Dino Crisis clone, only with even worse voice acting than either. There’s also some clipping issues and graphical glitches, and some poor AI. 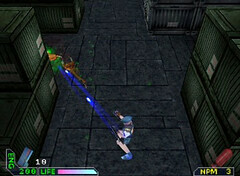 The game is also based on a Taito arcade game, Chaos Heat. 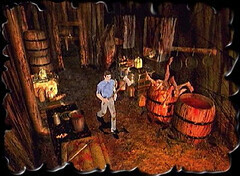 Based on the Evil Dead series of films, this game follows Ash as he returns once again to the cabin, and once again brings his girlfriend with him. And, once again, Professor Knowby’s tape of his reading the Necronomicon is played, freeing the Deadites who then kidnap Ash’s girlfriend. So now Ash must find the missing pages of the Necronomicon if he ever wants to seal their evil away forever…again. To do this, Ash must wade through hordes of respawning enemies in various locales, such as the house, a boy scout camp, and a hick farm, where he’ll have to face ghosts, skeletons, redneck zombies, and troops of zombie boy scouts. To fight them off, there are firearms, an axe, and the mighty chainsaw, which must be fueled up for use. And yes, there’s even a taunt button, though with only a handful of sayings, it gets old pretty fast. Considered a clone of Resident Evil, this game changes the zombies for vampires, as if the title didn’t really give it away. Players take control of homicide detective Keith J. Snyder who has been assigned to do bodyguard duty as a disciplinary measure at a new casino. A fire breaks out while he’s on duty, resulting in black liquid being sprayed from the fire sprinklers, which turns people into zombie-like vampires. From there, Detective Snyder must figure out what’s going on. While it obviously pulls a lot from RE, the game adds an interesting twist in the secondary weapon, a dart gun that stuns vampires so “white water” can be poured on them to turn them back into humans. Beyond that, it really never strays from the Resident Evil formula, though it does allow you to play some slots, since you are in a casino. Oh, and if you play this in English, prepare for some of the worst voice acting you’ve ever heard. While not survival horror in my opinion, these incorporate some elements, and I have seen them labeled survival horror on some websites. If you’ve exhausted everything else but still want more, try checking out some of these, as they may help sate your appetite. Alien Resurrection – Based on the fourth film in the Alien franchise and similar to Alien Trilogy, this first person shooter takes place on a space ship with hordes of aliens, face huggers, and chest bursters. Music is minimal, though that just makes it so you can hear the distant gun battles and screams as aliens slaughter people in other sections of the ship. There’s also an interesting system to switch characters, who are proficient with different weapons. Alien Trilogy – A first person shooter based off the Alien franchise, though a bit loosely as it does follow closer to Aliens, but mixes in the other movies. You play Ripley, who is attempting to save space colonists on LV-426 while blowing away whatever xenomorph gets in her way. Expect lots of action and gameplay reminiscent of DOOM. Blade – Based on the movie based on the Marvel comic book character of the same name, Blade is about a vampire hunter going after his favorite prey. It’s a third-person action title that allows multiple ways of getting through each level. While it wasn’t so highly regarded by critics and it’s not really much on the horror angle, fans of comics and vampire games might be interested. 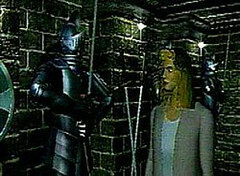 Dark Seed Series – With visuals designed by H. R. Giger, Dark Seed and Dark Seed II are two of the most visually disturbing adventure titles to ever appear. The games follow Mike Dawson, a writer and advertising executive, who is clashing against an alien force known as the Ancients from conquering the planet. But there is a time limit, and the clock is ticking. While the PlayStation ports are only available in Japanese, this game can also be found for the PC, so don’t despair. Dracula Series – A series of point-and-click games, titled Dracula: The Resurrection and Dracula: The Last Sanctuary, based on Bram Stoker’s novel Dracula, though set seven years after the fact. Mina Harker has suddenly fallen under Dracula’s curse once more, so her husband, Jonathan Harker, must venture to Dracula’s castle and discover what is going on. The sequel picks up immediately after the first game. The games are also compatible with the PlayStation mouse. Legacy of Kain Series – This series incorporates both the Blood Omen and Soul Reaver games, of which Blood Omen: Legacy of Kain and Legacy of Kain: Soul Reaver appear on the PlayStation. The series follows the ongoing power struggle in Nosgoth from the perspective of two vampires, the blood drinking Kain and his rebelling lieutenant, the soul drinking Raziel. The two games are drastically different, the first being a 2D action-adventure, while the second is a 3D action title. Nightmare Creatures Series – This series follows multiple protagonists in different periods of time battling against the alchemist Adam Crowley and the Brotherhood of Hecate, who are seeking to create a race of superhumans to do their bidding. Unfortunately the Brotherhood’s elixir doesn’t quite work, so instead of supermen, they’ve been creating a horde of monsters to do their dirty work. Though they incorporate elements of horror, these titles emphasize combat and are almost straight action games. Shadow Man – This voodoo-themed game based loosely off the Valiant comic book Shadowman follows Michael LeRoi, the Shadowman, an immortal warrior who must fight to protect the living from the dead. And so he must stop a group of serial killers from summoning forth an army of immortal soldiers to bring about the end of the world. 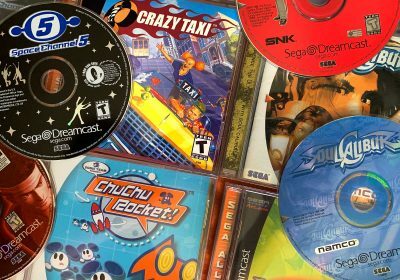 The PlayStation version is also considered the weakest of its releases, so it might be better to track this down on the Nintendo 64 or Dreamcast. Great job, Ack! 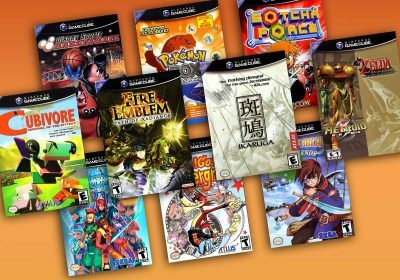 This list really hit all the major franchises as well as all the obscure titles. Also, a million points for giving Galerians a mention, I love that game. Man, I loved Parasite Eve and Dino Crisis. Great games. Yeah I’ve noticed a few Patrick, but thanks for bringing that one to my attention. I’ll try to get them fixed. Great article Ack! You didn’t miss anything. I hope this can be done for other genres for the different consoles. All the survival/horror games are one of the reasons I love the ps1 so much, even if some of them are RE clones. Nice one, didn’t know about half of these. Good list! I didn´t remember D was released on PSX! Overblood (the first one) is really great. The second is horrible, laughable. Nice work Ack! Very comprehensive list. You’re obviously the guy to go to for any survival-horror info. 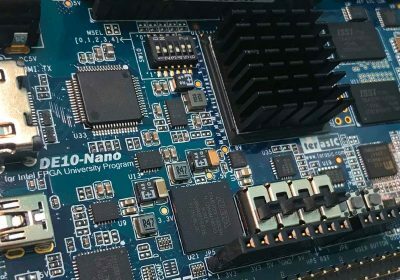 Awesome guide! I’ll definitely have to try a few of these out. Nice post as always. I wish I would have known somebody who had a playstation when I was younger. Looks like it had a lot of good games. RE2:Dual Shock was one of my favorite PS1 survivor horror games.Sadly though i have yet to add these other games as Silent Hill,RE3 and Dino Crisis 2 to my growning ps1 library.Prices on Amazon.com are outlandish for these and other high profile games! Actually breakwind, if you’re having trouble getting RE3, you might consider going for the Dreamcast version. I managed to find a pretty good deal that included RE2, RE3, RE: Code Veronica, and Dino Crisis for $45.00 on eBay. Don’t spend money on it even if you are a fan. Does anyone know if Hellboy on the PS was good? You mean Hellboy: Asylum Seeker? 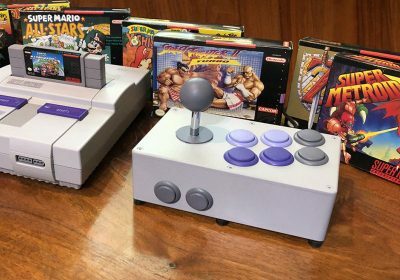 From what I’ve read, the controls are apparently pretty bad, and judging from YouTube videos, it suffers from some pretty horrendous load times and doesn’t look all that fun, but if you really want to check it out it tends to go for less then $10 used. Wheres Fear Effect and Fear Effect Retro Helix!?!?!? Such a great list, tho. Good job aside from forgetting those two. Glad to see this. I’ve owned most of these and still own the major ones. (RE/Silent Hill/Parasite Eve, etc.) Clock Tower has always been one of my favorites, thought the 2nd one was a disappointment. If only Silent Hill and Dino Crisis were on Gamecube it would be the ultimate survival horror machine, but since it doesn’t that belongs to the PSX. I want to mention one game for PSX called Covert Ops: Nuclear Dawn, from Activision I believe. It was basically a commercial failure and not horror themed at all, but if you enjoy a game like Resident Evil you will probably like it. It takes a lot from the movie Under Siege 2, from Metal gear Solid and also basically the same control scheme as Resident Evil except you’re on a train shooting live people. Check it out if you like RE. Fear Effect 1 and 2 should have definitely gotten a mentioned but other than that, great list. Thought I would add one that was missed, Vampire Hunter D, an anime movie had a game adaptation that was a survival horror. I liked it when new, unsure of how it holds up.